like WX is short for Weather. It's a hold-over from the days of CW, / Morse Code. since the upper atmosphere will bounce space-bound RF signals back down to earth. So, If I worked NYC from here, on 14.35 MHz, that's not really DX, it's so easy.. But, if I worked NYC on 1.296 GHz, that's real DX! Because 1.296 GHz is in the micro wave band and will just fly off into deep space.. Like UHF..
when I saw a plane flying just over the Canadian border.. The plane was at 43,000 feet @ 328km or 182nm.. I never expected to track AC over Canada. I'm amazed. It's Saturday morning and there aren't a lot of planes around.. Just 70 making noise and 18 trackable (extended squint?). So, that low noise level might allow some planes to provide a little DX excitement! Wow! 365km=226.8 miles! Then, I saw the dreaded dotted line track! Dang, I installed Rev 2.7 adsbScope yesterday and forgot to turn off the "Show Predicted Position" button! 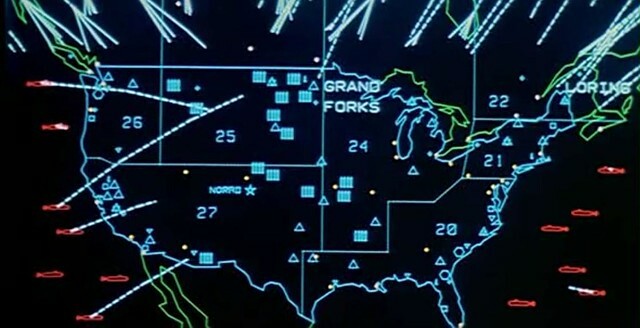 Watching planes flying in to the area always reminds me of that old movie 'WarGames'.. The backyard trees (North side) are getting a lot more leaves this week, and the foliage signal should be getting pretty bad. But once in a while, some DX makes the wonder how bad the losses are.. This plane popped up about 25 miles north of the US border at 39,000 feet. Not a record, but 206 miles is pretty good range in that direction.